I swear this series is getting screwier by the issue. Really, does anything make sense anymore? I dunno, it's kinda making more sense to me as the series progresses. The first couple of issues I had zero idea of what was happening. Now I have...like, one idea of what's happening. Taking "deconstruction" literally, I see. No just tossing the word around to try to look impressive. I don't understand why they slaughtered Funky Flashman and the guards. The two of them are clearly capable of accomplishing all this without killing anyone. 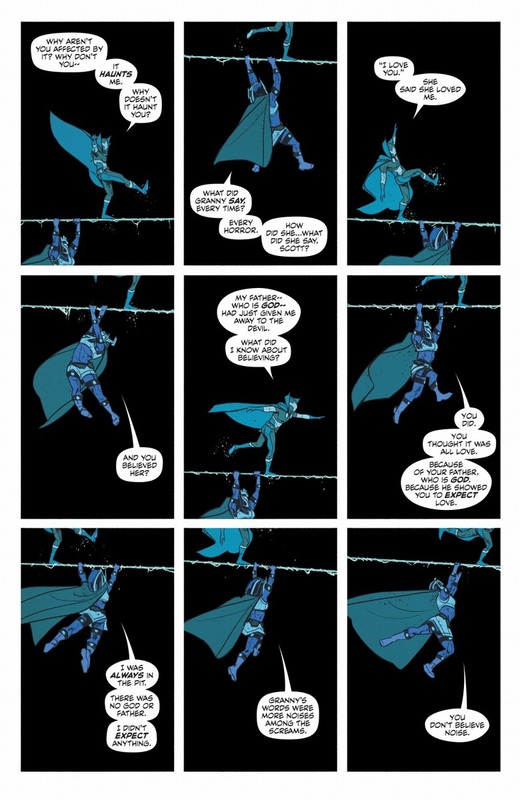 Tom King doesnt shy away from violence at all. Plus theyre really pushing the whole "Warriors in a bloody forever war" angle of the New Gods vs their super hero elements. I’ll be honest, I really want to like this series, but I’m a bit confused on the whole thing. I feel I’m just being ignorant, though. -Darkseid is... a baby, isn’t he? Or dead? 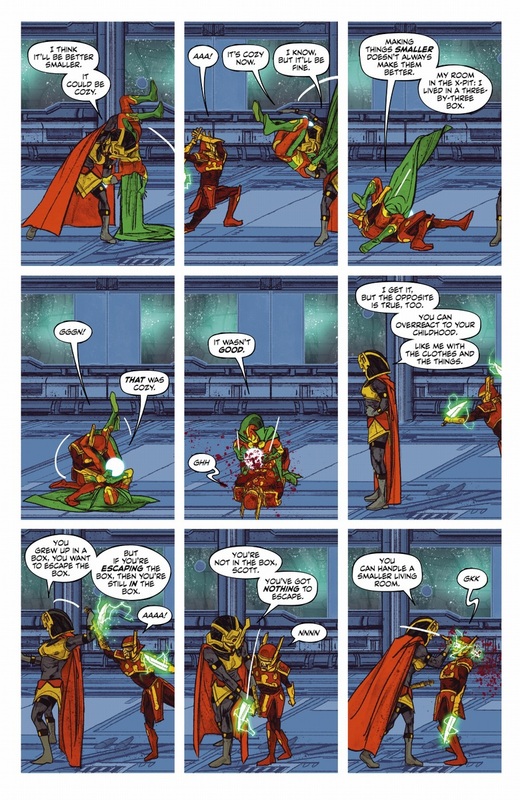 Wasn’t there a big fuss made in Justice League and Dark Nights: Metal about the infant Darkseid? In which case, why is everyone acting like he’s alive and a threat? 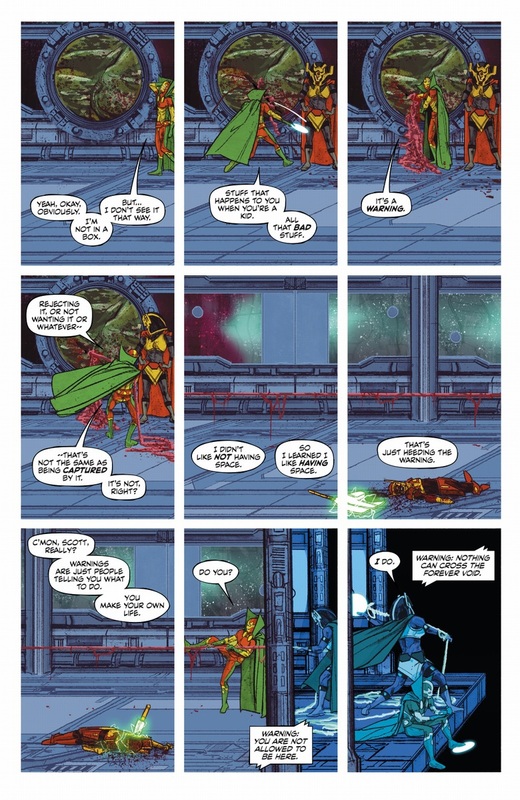 Even Granny Goodness? 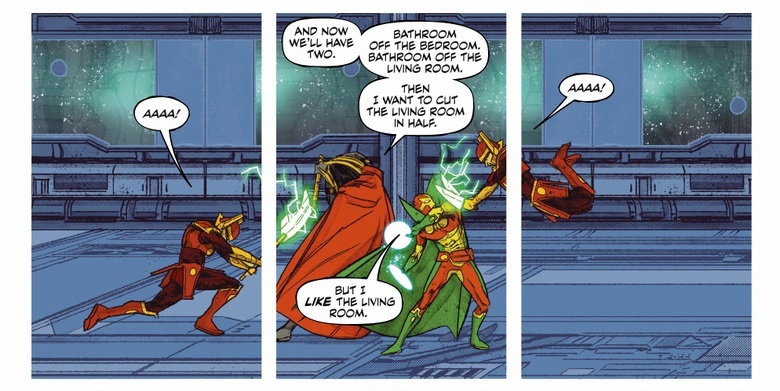 -What’s the point of the random narration boxes from Mister Miracle’s old ongoing? -What’s with Orion? I only really know of him from Wonder Woman, but while he was a bit blunt, he never seemed as mean, tyrannical or downright evil to the extent he is in this book. -What’s with all the sudden killing off of the New Gods characters? -I’ve read that the series is meant to be a representation and metaphor of how anxiety and depression feels to a person. While I can relate to an extent (like with Scott getting knocked down for standing after being told to stand), when did Scott ever suffer from depression or anxiety, let alone suicidal thoughts? I don’t know, I feel like the metaphor or allegory is taking precedence over a cohesive plot and characters (though that might be the point). Also (and this turned me off of Batman) this is just personal preference, but the disjointed way people talk gives off an archetypical ‘Bendis speak’ vibe where the characters don’t really have any unique voice or character of their own, so while they say their lines, I never really get the feeling they’re actually talking or speaking their lines (not with any meaning, at least). I don't think this series is in continuity, so that answers most of your questions right there. Essentially the premise is that Darkseid has finally discovered the anti-life equation and has used it to seize control over reality. It's like when he trapped the other Mr. Miracle, Shiloh Norman, in the Omega Sanction - an endless series of increasingly shittier lives. Except this time, the life that Mr. Miracle is trapped in . . . is his own! !